Rocky Singh and Mayur Sharma are making their way to Heritage Cuisine Summit and Food Festival in Amritsar in search of new foods and old gyaan. The two familiar faces will be seen hanging around chefs, shooting the breeze with other foodies and just doing that thing they do! Rocky Singh and Mayur Sharma believe that anything worth doing must be fun and unconventional! Having applied this principle to everything they do their journey continues to bring them joy. They are widely acknowledged as India’s leading experts on street food and regional cuisine. In the ‘reel world’ their cult show Highway On My Plate (HOMP), aired on NDTV Goodtimes for over 7 years, has steadily eaten it’s way towards completing a record 230 episodes shot during travels of over 100,000kms on the Highways and roads of India. Besides great food, riveting stories and a huge community of fellow food lovers, HOMP has also collected the Indian Telly Award (2008) and the Indian Television Academy Award (2012) for the ‘Best Travel Show’. Awards also include those won by sponsors such as Google & Lays (Guess Whose Flavor for IPL) for creative in-program advertising & product placement. Recognizing their unique capabilities for entertainment and promotion, Directors (Imtiaz Ali and Rohit Shetty), actors (Ajay Devgn, Arshad Warsi, Shreyas Talpade, Alia Bhatt etc.) and sportspersons (Ajay Jadeja, Chris Gayle & Adam Gilchrist) have done shows with Rocky and Mayur to help promote their movies and shows. 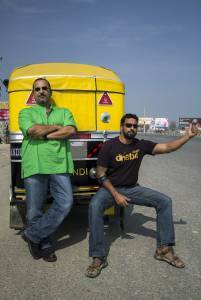 The duo has also anchored Vital Stats of India (The History Channel) and Rocky and Mayur’s Food Express (Zee). They’re currently pushing the envelope further by developing videos for the first ever-expert curated list of outstanding eateries across India. Proud ambassadors of the incredibly unique and diverse flavours of Indian cuisine and culture Rocky & Mayur contribute articles and reviews on food, travel and lifestyles to publications such as FHM, Food & Nightlife, Rail Bandhu, BBC Good Food, Zomato.com and the New York Times online (India Ink). Their books Highway On My Plate – the Guide to Indian Roadside Eating – Vol 1 & 2 (Random House) are bestsellers in India and won ‘Best in the World’ awards at the Gourmand World Cookbook Awards in Paris (2012) & China (2015) respectively. The duo hosts the annual NDTV National Food Awards where their brand of irreverent humor and high energy makes for some highly entertaining evenings. Famous for their onstage presence, off-the-cuff wit, and impromptu performances as MC’s, they have hosted exciting high impact events across the country for clients such as the World Travel & Tourism Council, CII, Jubilant Foods (Domino’s & Dunkin Donuts), Future Group, Ministry of External Affairs (Govt. of India) etc. They deliver high impact talks on Food & Travel related subjects at various forums such as the Zomato Summit. Recently they spoke at the TEDx to define the future of Indian food. Their mission is to always provide a unique, insightful and thought provoking take on their subject. They bring the same contagious enthusiasm, creativity and professionalism to their ‘real world’ work. Their organization MindsEye partners with organizations to design and deliver high-impact experiential training and conference events. MindsEye has facilitated programs for senior Leadership & Cross-functional teams at Tata Motors, Boston Scientific, IBM, Microsoft, Pearson Education, Oracle, and Puma, among others. The areas of intervention include Innovation, Leadership, Teambuilding, Change Management and Organization Culture Integration. When they are not on the road less traveled for work they still enjoy traveling with their respective families and to pursue their passions. Rocky is an ardent ornithologist, photographer and scuba diver while Mayur investigates why high altitude treks have such ‘breathtaking’ views.